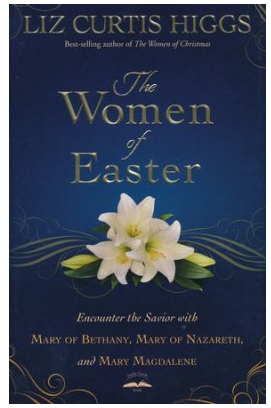 With her carefully constructed re-telling of the final weeks of Jesus’ life, Liz Curtis Higgs honors the women who were part of that story in The Women of Easter: Encounter the Savior with Mary of Bethany, Mary of Nazareth, and Mary Magdalene. Rather than lifting her protagonists out of the story one by one with three distinct bios, she considers them in context as they interact with each other, with Jesus, and with other major players within the narrative arc of Scripture. Liz shares the encouraging truth that even the very first Easter was not a picture perfect affair. No. 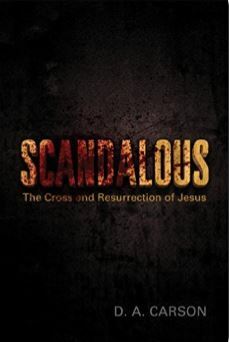 It was “full of disbelief, fear, and confusion” as even Jesus’ closest disciples struggled to absorb the truth. Likewise, with our Easter bonnets askew and our Resurrection Sunday dinner menus still up in the air, we are invited to come, by faith, to the empty tomb. We are invited to rejoice, and we have been charged with the privilege of sharing the good news. By faith, we, too, are The Women of Easter. In a decision that somehow manages to seem both arbitrary and precise, the Council of Nicaea met in 325 A.D. and determined that Easter would be celebrated on the first Sunday after the first full moon that falls on or after the first day of spring. 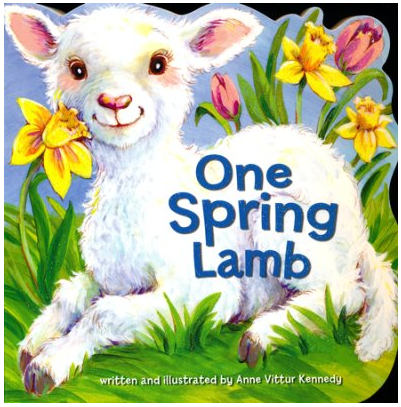 Easter and spring are also holding hands in Anne Vittur Kennedy’s festive board book, One Spring Lamb . By the way, that adorable spring lamb shows up somewhere in every scene! My grandson was not quite two when I first reviewed One Spring Lamb, but even now, this is one of the books he asks me to read to him when he comes to visit. Holding hands around a table; a focus on gratitude and shared celebration; dressed in their Easter best, the Berenstain Bears lead the way into a fun and family-oriented celebration of Resurrection Sunday. Presenting as normal the discipline of church attendance, prayer before a meal, and portraying the beauty of love and respect among extended family, The Berenstain Bears’ Easter Blessings by Mike Berenstain (son of Stan and Jan who began the series in 1962) will come alongside the parents of young children with words and ideas for a meaningful celebration. All the blessings that we enjoy (and take for granted) come through the hand of the God who orchestrated the miracle of the resurrection. 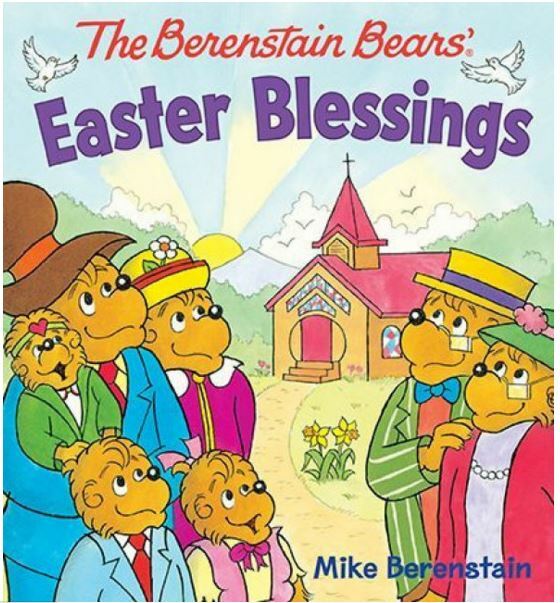 Join the Berenstain Bears in counting and listing Easter blessings. Beginning with the glory of a spring morning and a cozy tree house, they move in ever widening circles to include friends, the church family, and the public servants who care for us and keep us safe. In the weeks leading up to Easter, write them on slips of paper to hang on a spring-branches bouquet, or toss them, one by one, into a festive Easter basket and then read them all during Easter dinner. Yes, He is risen! He is risen indeed! Esther Emery unplugged her life from the Internet in November 2009, and for one year, she lived a life without email, without a cell phone, and without a debit card. No Google, no on-line shopping, no text messages. She walked away from her blog, an encouraging Facebook community, and any trace of an on-line presence in a leap of Stop-doing-everything-you-know-and-start-doing-everything-you-don’t-know Faith. 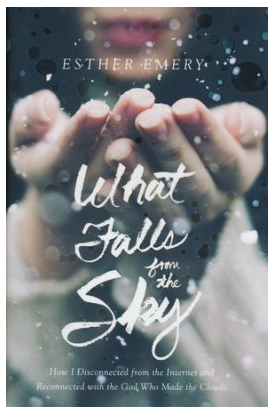 What Falls from the Sky: How I Disconnected from the Internet and Reconnected with the God Who Made the Clouds shares this journey in four parts that correlate with four glorious gifts from the sky: snow, rain, sunshine, and fog, but I found her most compelling words were about a celebration of Easter in community. By this, she was introduced to the beauty of “borrowed” power from the crucified and risen Christ and the truth that this is “not theoretical at all.” The vulnerability of Good Friday left Esther defenseless against the claims of Christ upon her life, and she was captured by the forgiveness that conquers fear, the “Jesus of the brokenhearted, the Jesus of the suffering.” Ironically, as her spiritual life came into focus, the material world also became sharper. I’m sure there will be those who find significance in the juxtaposition of Easter and April Fool’s Day in 2018, but whenever Easter falls on the calendar, I find that my heart is more prepared to celebrate Easter if I spend some time during the Lenten season reading about the two historical events that are central to Christianity: the cross and the empty tomb. What happened? What does it all mean? Irony, using words that normally mean the opposite of what is actually being said, brings situations into sharp focus, and there were four profound and dramatic ironies at work in the narrative of Jesus’ crucifixion. May the outcome of all our ponderings during this season be a stronger belief in the resurrection and a deeper following of our wounded God. 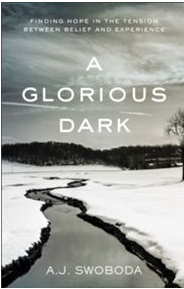 A Glorious Dark reveals a God who “stand[s] tall” above human history and invites (rather than scorns) the questioning heart. After all, of the thirty-one questions Jesus posed in the Gospels, He answered only three. When God does not break into history to rectify the list of problems set forth in my latest memorandum/prayer, it will be helpful to remember the messy way in which that one weekend in history played out for those who were on the scene. Once again, the life of Jesus will be made manifest, a glorious life emerging from a glorious dark. Thanks, for reading along and for joining with me in the celebration of all that is ours because of our risen and living Savior! These books were provided by various publishers in exchange for my review. It’s my pleasure to feature them once again here, all in one place for your Easter enjoyment.